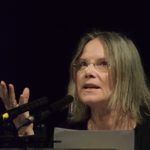 Carolyn Forché is a Human rights advocate, Professor of English and Chair of the Lannan Centre of Poetics and Social Practice at Georgetown University. She has received many prizes and awards, including a Guggenheim Fellowship, Lannan Literary Fellowship and The Academy of American Poets Fellowship. She is the author of four books of poetry: Gathering The Tribes, which received the Yale Younger Poets Award, The Country Between Us, chosen as the Lamont Selection of the Academy of American Poets, The Angel of History, which won the Los Angeles Times Book Award, and Blue Hour, a finalist for the National Book Critics Circle Award.